When it's time for a break, being stylish and comfortable shouldn't be hard work - you work hard enough as it is. Keep things simple with classic, easy layers for those crisper days and nights. Here, we show you a way to do this with lighter spring-appropriate colors while staying heavy-duty and rugged. A timeless, reliable style stretching back well over a century, rooted in the tough workwear worn by laborers, miners, and industrial workers. Usually made from denim or heavy canvas, the chore coat is not only for the working man, but also a great look for after-hours or weekends when we want both functionality and style. Like a good pair of old boots, once you break in your chore coat, you'll never want to take it off. And since it's in a neutral color, you won't have to. 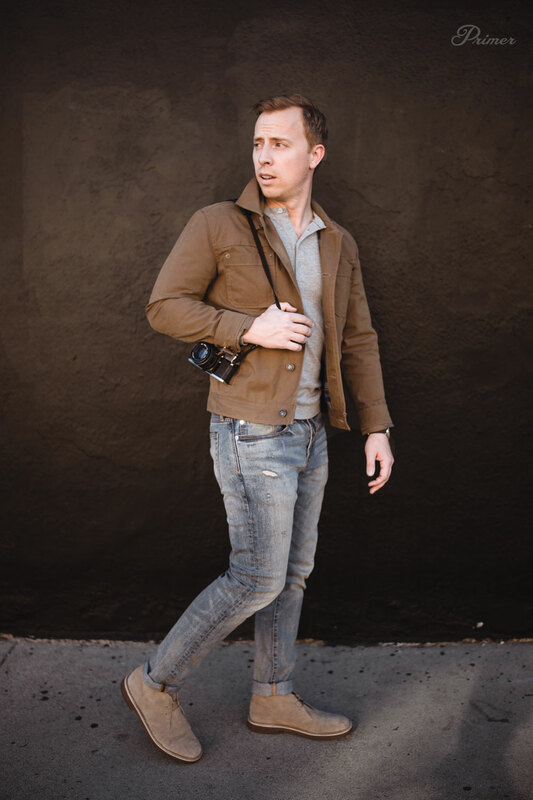 Lighter colored denim is always a great casual look for when the sun comes out, but together with the lighter neutral hues of the shirt, jacket, and shoes, we retain that low-contrast color combination to stay earthy and spring-toned. Don't be afraid of lighter denim: These aren't your 90s jeans. Lighter jeans make a ton of sense for the warmer months; just imagine wearing thick raw selvedge when it's 90 degrees. Denim that is slightly worn or faded adds to the ruggedness of the outfit. And a flattering slim taper with a cuff shows off the boots. Light gray complements the tans and lighter hues of the outfit, whereas a darker shirt would contrast and compete with this palette, not to mention lack that “light” spring feel. This shirt doesn't have to be fancy – the plainer the better (this is workwear, after all). 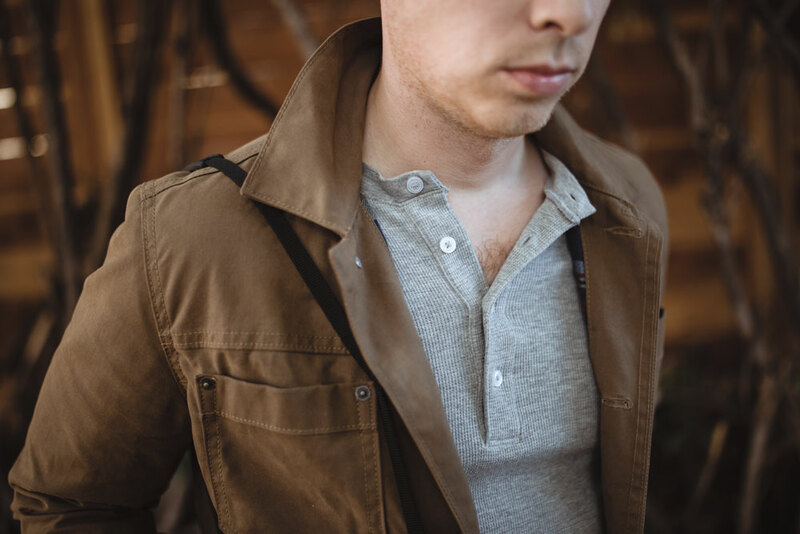 Keep it partially unbuttoned for that nonchalant, action-ready look. I chose a thermal henley here for a little added texture. 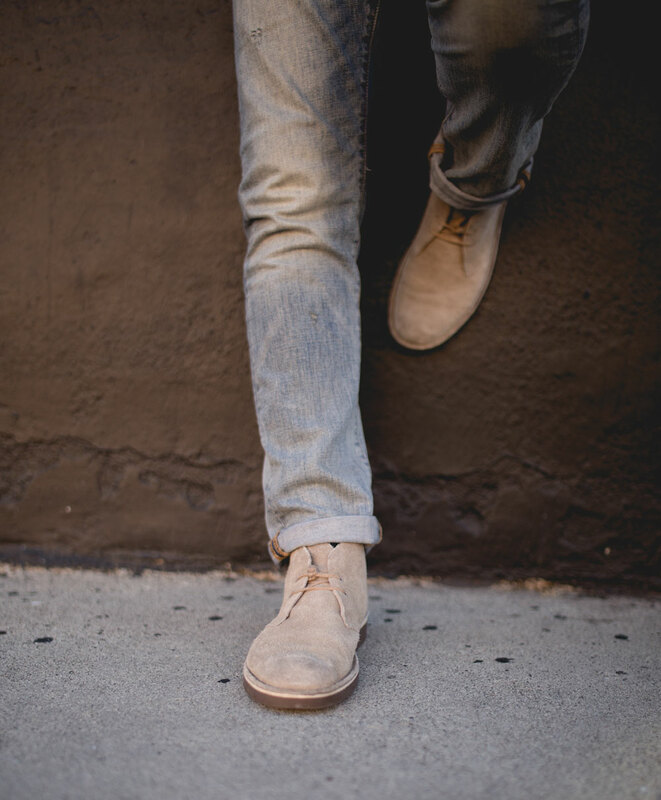 A comfortable pair of suede walking chukkas are ideal here, and choosing a lighter color like this sandy taupe keeps the whole getup low-contrast. Desert boots have a long history – you can opt for the original crepe sole version or these rubber soled alternatives. Like this look? Please share it! Then chat with me in the comments. Need Clothing You Can Wear When It’s Hot and When You Have to be Able to Move? Awesome as usual Andrew. I really like how you break down all the elements. I’m glad that being a reader of Primer for a while I’m just missing the chore jacket from this outfit as well as the lighter denim. Am I right in thinking its best not to pair a tan chore jacket with khakis? Or would it work if the colour is significantly different? I think the one he’s wearing is from American Eagle. I have the same jacket and consider it a steal for the price I paid. I’m pretty sure it runs smaller than the Carhartt jacket. And I agree that this was awesome as usual. I already have this entire outfit, and now that Andrew reminded me of that, it’ll certainly be getting lot’s of wear. I think the jacket would work fine with khakis, but like you said, as long as it’s a different color. I wouldn’t use a significantly different color, like a dark navy, but just something like light grey or cream khaki. Thanks Rogun, I’m gutted that I’ve missed out on that jacket from American Eagle. I’ve tried tracking down the Pointer in the U.K but it’s just too difficult to get hold of in person. 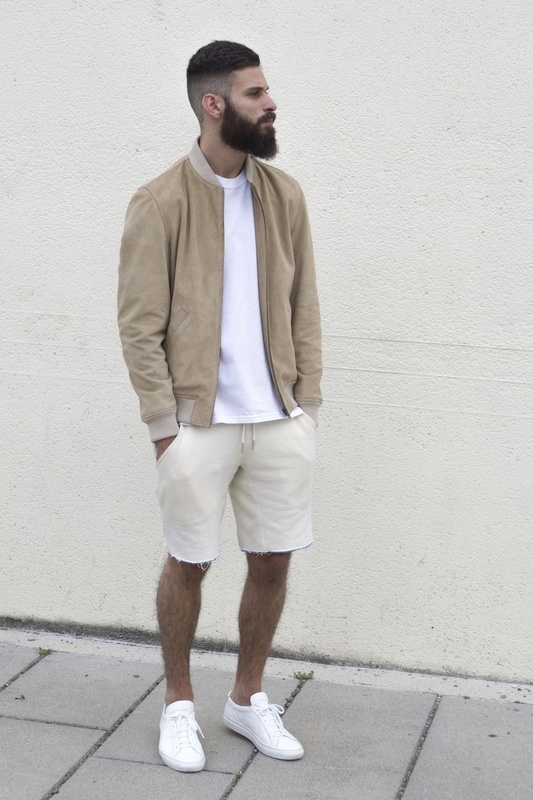 I may have to go for a shirt/ jacket in a similar colour to get the look. But the great thing being the principle is still there of the lighter wash denim and boots combo. I think you have lot’s of options on chore jackets, so that shouldn’t be a problem. I just got lucky with the one by American Eagle. They have some items that are made by brand-name manufacturers, but have the American Eagle tag on them, and I think this jacket may be one of them, because it seems nicer than what you’ll usually find from AE. I picked it up around a year ago and I think it’s been out of stock for a while now. Thanks for all the detailed info. I actually got a hold of the Gap jacket Andrew mentioned. So I’m looking forward to breaking it in. The Pointer jackets look great. And hopefully AE will bring out some more like it next season. Thanks os much!! Yep Rogun is correct, I picked the one up in the photos from American Eagle for $35(!?) a little while back. It’s my regular size, but you’re right, you’ll want it to fit slim. That’s a really good price for such a nice jacket. I know you’ve done a few alternatives but the Gap one has sold out by me and I can’t get my hands on the Pointer one. Other than the linked ones is there any you’d personally reccomend? Hey Andrew, just wanted to let you know I just grabbed the Gap chore coat on sale. That was a fantastic option for those abroad that don’t have access to some of the other choices. How would you wear it? Unzipped and keep the rest of the outfit the same? Nice! Glad it worked out! You could do unzipped or a quarter zip. Thanks Andrew, will you be featuring a chore coat more in future getups? Or failing that maybe an inspiration album? I know you’re busy but I’m really glad you’re bringing these new pieces to the fore. I’d never have tried the style otherwise. Thanks Andrew, will you be featuring a chore coat more in future getups? Or maybe an inspiration album? It seems like a great investment. Awesome casual Getup for the Winter-Spring turn! I agree Zac I have everything except the jacket and light denim. I was wondering Andrew, with the warm spring and summer months is it a good idea to lean on strictly lighter denim? I was thinking not only to avoid the heavier material but also the lighter denim working better for the increased about of bright sunlight during the day? If so do you recommend a brand or a wash that would work best for versatility? Also would a metal band watch work with this outfit? Trying to track down the watch Michael C. Hall wears on dexter. Anyone know where I can find that? No, I don’t think you have to lean strictly on lighter blue denim – dark denim will always have its place, but you can also utilize different colors like green, tan, and white denim too. A metal watch would work great, I actually have a vintage Timex that looks very similar to Dexter’s with the expanding metal band. You might try searching eBay for that. Thanks Andrew. But I’ve heard the dexter watch is a Waltham Self Winding 25 Jewel from 1976. Any idea if any are available? Overall, it’s a good outfit. The jeans look too tapered in my opinion, borderline skinny jeans. It throws off the upper body/lower body balance. I haven’t had any problems! I know it’s a matter of personal preference and that the trend is going skinny fit for pants, but for my personal preference, they all look disproportionate. I remember a previous article on low rise jeans/pants and there was an example of Michael phelps wearing low rise pants and it was pointed out how it made him look top heavy and lopsided. Maybe it’s the angle of the photo but to me andrew these jeans look way too small on you. Not only too tight but also to short in length because of the cuff and too narrow, resembles a golf tee. Don’t get me wrong I know I love slim/tailored fitting clothing, I just feel both the henley and jeans look like they were picked out of the kids section and are way too small for you. The look is great and spot on, but for some reason I don’t think the size or fit or angle of the photo flatters you as much as it could. Sorry my comment was added to the wrong chain for some reason. You say golf tee I say “v taper”! Haha the difference between slim and these jeans are the knee down taper. While “skinny” is a name retailers use, I use it the way you are, to suggest a garment is too tight. It may be the photo or personal preference, but these are one of my most comfortable and go-to pairs of jeans. A more tapered look has been coming for and been standard for, a number of years, and if it’s not for you, you can of course wear slim or straight. For my preferences, I find 15.5″+ leg openings to look too wide these days, and to your point about proportions, throws off the fit of other fitted items. 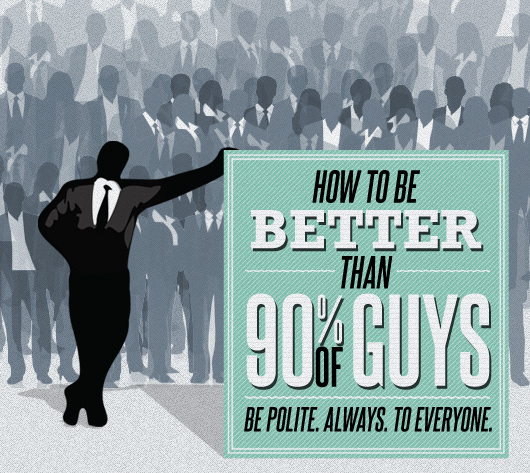 You have to find sizes and fits that work for you and your likes. Cool shooting Andrew. Love Levy canvas trucker! I have a leather pair of Clark’s Desert Boots, but taupe suede seems so versatile. Is the suede material as rugged as the leather? Just discovered this look and am a big fan. I’d appreciate some suggestions on alternatives for the jeans. I haven’t been able to find anything similar to that wash. I usually buy straight fit. I bought the American Eagle jacket on ebay but its too small so i’ll be reselling it. The Clark’s boots are in the mail. I’m still deciding on the henley. Thanks for any and all help!